There's a new trend, and it's making your outdoorsy activity of wine drinking more economical and more green. It's rosè on tap, and it's popping up all over the city. Founder of eateastcoast.com. Proud member of www.foodietribe.org. Can usually be found freestyling around various east coast neighborhoods in search of the best food and drinks. As soon as the weather breaks in NYC everyone scrambles to find the best outdoor drinking spot, and it's no secret that the spring and summer months have been coined rosè season. But, there's a new trend, and it's making your outdoorsy activity of wine drinking more economical and more green. It's rosè on tap, and it's popping up all over the city. There's something about wine on tap that makes it a novelty. Maybe it's the little time it takes for the wine to get from the tap to your glass, maybe it's the higher quality of wine at a better price point, or maybe the fact that last year alone NYC company, Gotham Project, was able to eliminate 2 million glass bottles by serving wine on tap. According to the Gotham Project, the country's largest provider of wine on tap, there are more than 200 restaurants and bars in NYC serving serving Gotham Project's tap wine, and over 100 of them are serving one of their rosè options. Last year, rosè, was the company's fastest growing item.That's 100 places to celebrate rosè season with quality wine at an affordable price point. So we know rosè season is alive and well, and here's your list of the top 10 places to get your rosè- on-tap fix. Oyster happy hour and rosè on tap, yes please. 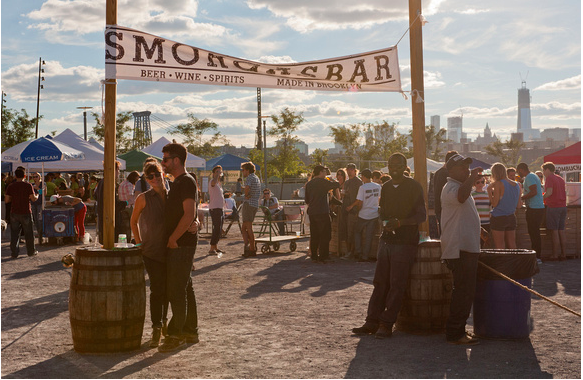 What's not to love about Gotham West Market? You could have a glass of rosè, the Genuine Roadside chicken sandwich, and Ample Hills Creamery with out leaving the building. It's by Mercer Street Hospitality. There's Wine Wednesday. They serve a lot of breakfast sandwiches at brunch. See picture below. Yep, that's why you need to go here. Why not drink rosè while enjoying the High Line? Happy hour includes $25 carafes of wine on tap. For when you're feeling swanky. $35 carafes and outdoor space, plus all the beers you can dream of for your non-rosè drinking friends. There's a pinball machine and $5 wine at happy hour. 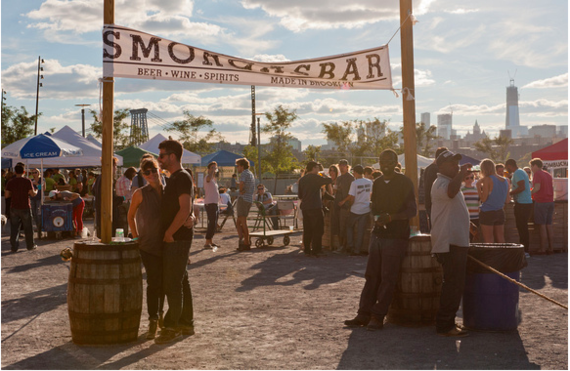 Eating your way through Smorgasburg with a glass of rosè makes for a pretty great little Saturday.